Not far from my hotel, walking to the shuttle, was this plaque. 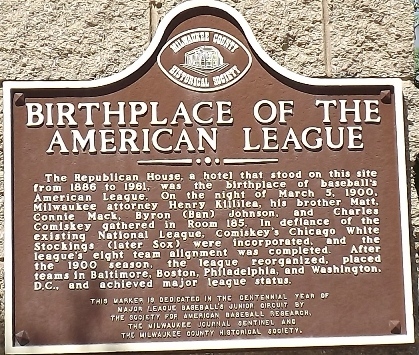 So, again - I MUST ask - WHY were the Brewers moved to the National League, only to have the Houston Astros moved to the American League to 'even things out'? Why? 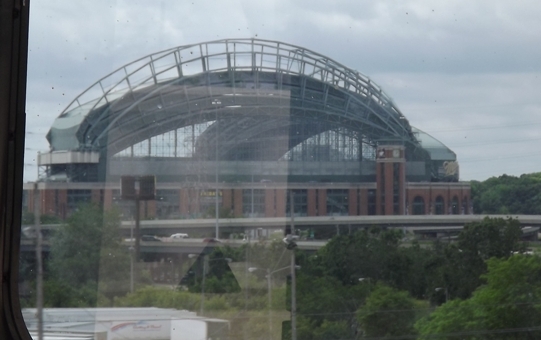 Miller Park from the shuttle. 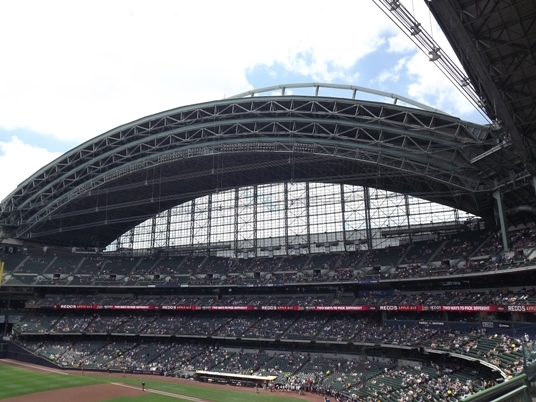 Looks like the roof is open. .
Yep - roof is open. Beautiful day. 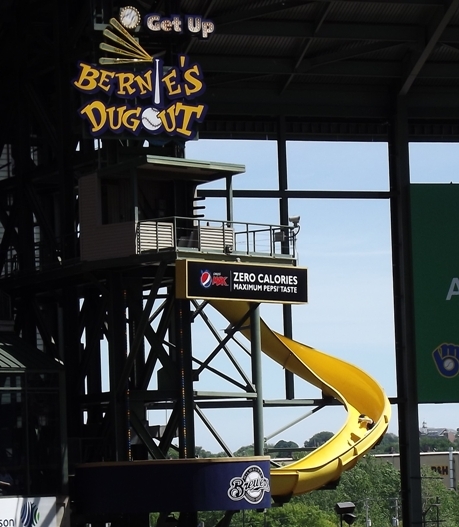 Ryan Braun hit a home run, so Bernie slid. Charlie Blackmon is on fire this year. 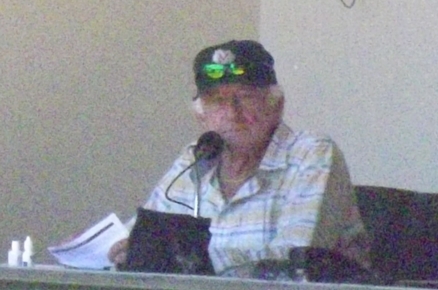 What is a visit to Miller Park without Bob Uecker? 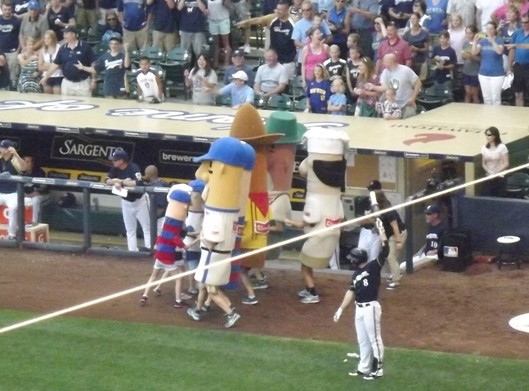 Sausage races! It was Sunday, so it is the relay with the 'little' sausages. Final. 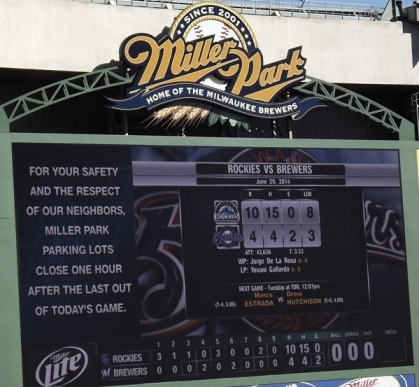 Braun hit a home run, but that was pretty much the only bright spot on this day for the Brew Crew. ***OH - I didn't take any pictures, but the gourmet dessert selection here is beyond belief! We were on the Club level, so that may have had something to do with it, but I've been on Club Levels in other ballparks and nothing I"ve seen has ever compared to this. They had dessert carts galore! Sadly, I did not plan, and this time I only got the 'ice cream hat'. But they had a Reese's cup Cheesecake that looked amazing.